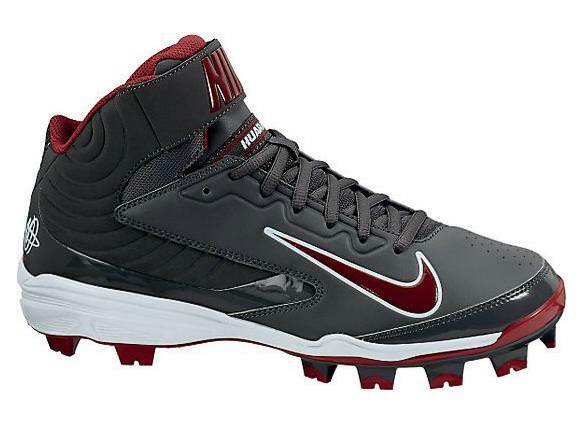 Some new Nikes, the Huarache Strike (metals and MCS), just showed up today on Baseball Express. They can be found here. I’m stating the obvious here, but these are the Huarache Pros with different colors. Apologies for another car reference: this is like when car companies slap different badges on the same car and sell them under different brands (i.e. Oldsmobile Silhouette, Chevy Venture). Its a cost-cutting method. And that swirling design feature by the ankle sure looks a lot like the UA Spine Highlight, no? I’m not sure about the metals, but the molded have been around for a couple months. I saw them in the August issue of the Baseball Express catalog.